4. Increased exports to Latin America. All of the above psychological, economic, and financial factors in the case of the Cuban Diaspora over the last fifty years to this country replicate the basic requirements of the academic concept of the entrepreneurial event. The French refugees who left North Africa for France, the East Germans who escaped to West Germany, the South Vietnamese airlifted to the U.S. at the fall of South Vietnam, and the Cuban Exiles that first came to Miami and later moved to other parts of the U.S. had something in common: their entrepreneurial energy. The psychological factor resulting from a personal trauma that impacts the potential entrepreneur. This can be the result of a geographical displacement due to political or economic reasons, a family crisis, or the loss of a job. Arrival into an environment where there is stability and relative personal security plus social peace. That is, the lack of insecurity due to legal matters such as confiscatory laws, ideological pressures, etc. The availability of sources of credit at low interest rates, free technical advice, educational opportunities as well as governmental support for those willing to assume the risk of launching an enterprise. The existence of the above three factors creates a critical mass that generates a process known as the entrepreneurial event, which usually results in the decision of the potential entrepreneur in first planning and then assuming the risk of launching the enterprise. 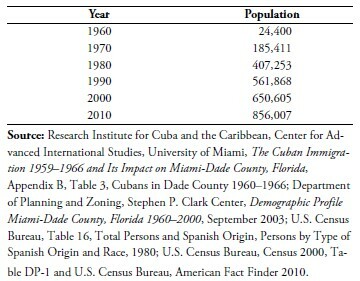 Table 1 shows that, in the case of the Cuban Diaspora, the propensity of this immigration to the U.S. to create new firms initially started in Miami, and it later expanded to the rest of the U.S.
Providing support from friends, families and neighbors to early entrepreneurs. Patronizing the small Cuban owned neighborhood firms. Recreating organizations that had fostered professional development in Cuba, such as the Asociación Interamericana de Hombres de Empresas (AIHE) and the American Club. A total of 117,798 firms, collectively generating over $ 24.5 billion in receipts. Of the above firms, 16,315 had employees providing work to 109,659 workers and an annual payroll of almost $ 3.5 billion. The 117,798 firms located in MDC represented 46.9% of all Cuban-American firms (251,070) in the U.S. at the time the survey was taken. The 2010 Survey also provides the following data regarding the status of Cuban-American firms across the U.S.
74.2% of Cuban-owned U.S. businesses (186,312) were located in Florida. California had 15,476 or 6.2% of all Cubanowned U.S. firms. THE CUBAN-AMERICAN BUSINESS COMMUNITY AS PART OF THE HISPANIC BUSINESS COMMUNITY IN THE U.S. The original Cuban exiled community in the U.S. gradually evolved into the Cuban-American minority, and has become part of the Hispanic population in this country while still retaining strong cultural and emotional linkages to the home country. Number of firms: 251,070 (11.1% of the total universe of Hispanic owned firms in the U.S. economy in 2007). Sales and receipts: $51,252,333,000 (14.8% of the total sales and receipts of Hispanic-owned firms in the U.S. economy in 2007). Firms with employees: 32,329 (12.9% of the total firms with employees of Hispanic-owned firms in the U.S. economy in 2007). Employees: 242,993 (12.8% of all employees of Hispanic-owned firms in the U.S. economy in 2007). There is a correlation between the increase of the size of the Cuban Diaspora and the number of firms created by exiled Cubans. Miami-Dade County has served as a “business incubator” in the creation of the Cuban owned firms. The “entrepreneurial event” resulting in the creation of enterprises found in other immigrations has been duplicated and validated in the case of the Cuban Diaspora. Internal factors such as past managerial know how, past experience, persistency and hark work, as well as personality traits associated with this Diaspora, have all contributed to a proclivity to plan and launch new enterprises. Finally, this successful experience in the U.S. relative to the creation of enterprises might perhaps be transferred to a free Cuba, and the lessons learned in this country could be applied in the island under the proper circumstances. 1. http://www.census.gov/econ/sbo/get07sof.html?11. Survey of Business Owners—Hispanic-Owned Firms: 2007. Published 2010. 2. Survey of Business Owners—Hispanic-Owned Firms: 2007, op. cit. 3. Hispanic-Owned Firms: 2002, Table 1; Statistics for Hispanic-Owned Firms by Kind of Business and Detailed Hispanic or Latino Origin 2002, p. 1, Table 5; Statistics by Detailed Hispanic or Latino origin for Selected Metropolitan and Metropolitan Statistical Areas With 100 or More Hispanic-Owned Firms: 2002, p. 230, issued August 2006. U.S. Census Bureau, Survey of Business Owners— Hispanic-Owned Firms: 2007, Summary of Findings, http://www.census.gov/econ/sbo/get07sof.html?11. 4. The Hispanic Population: 2010, Table 1. Hispanic or Latino origin Population by Type: 2000 and 2010. 2010 Census Briefs. United States Census Bureau, U.S Department of Commerce, p. 3, issued May 2011. 5. Survey of Business Owners—Hispanic-Owned Firms: 2007, op. cit. 6. 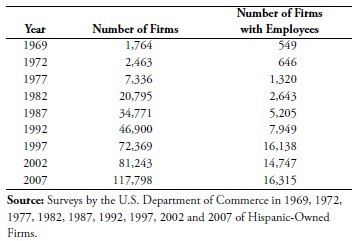 Hispanic-Owned Firms: 2002, Table 1; Statistics for Hispanic-Owned Firms by Kind of Business and Detailed Hispanic or Latino Origin 2002, p. 1, Table 5; Statistics by Detailed Hispanic or Latino Origin for Selected Metropolitan and Metropolitan Statistical Areas With 100 or More Hispanic-Owned Firms: 2002, p. 230, issued August 2006; U.S. Census Bureau, Survey of Business Owners- Hispanic-Owned Firms: 2007 Summary of Findings, http://www.census.gov/econ/sbo/get07sof.html?11.